Black drafting chair (extended height office chair). Form fitting contoured back and thickly cushioned seat and back. Aluminum 26" diameter, five-star base with chrome finish. Two-tone dual carpet wheels (casters). 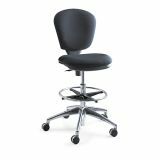 Safco Metro Collection Extended Height Swivel/Tilt Chair, Black Fabric - Metro Extended Height Chair features a contoured back, thickly cushioned seat for superb comfort, and chrome-plated adjustable footring. Adjusts 23 to 33. Functions include pneumatic seat-height adjustment, 360-degree swivel, tilt and tilt tension. Chair holds 250 lb. 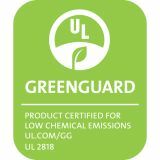 and includes 100 percent acrylic fabric upholstery, 26" aluminum five-star base with chrome finish and two-tone, dual-wheel, hooded 2-1/2" carpet casters. Seat size is 18-1/4" wide x 17" deep. Back size is 17-1/4" wide x 16" high. Optional Adjustable Arm Set with 3" height adjustment range does not come with chair and is sold separately. Chair meets or exceeds applicable ANSI/BIFMA standards. Swivel tilt mechanism with adjustable tilt tension accommodates users of all sizes. Two-tone dual wheel carpet casters.